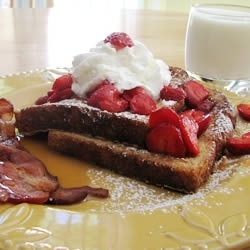 Do you want my best French Toast recipe? I have a few recipes that produce the best you will taste. Smother them in homemade butter, and them dredge them in powdered sugar. Place the flour in a mixing bowl and whisk in the evaporated milk. Add the salt, cinnamon, pure vanilla extract, eggs and white sugar; whisking until smooth. Heat a griddle or frying pan over medium and add the butter. Whisk the mixture well and dunk the piece of bread in it, turn over and place in the hot butter. Cook on each side until golden brown. Serve with warm maple syrup. NOTE: You may also use powdered sugar, homemade whipped cream and sliced fresh fruit. Here's the best French toast recipe, and do you want to know the secret to perfect french toast? Homemade cinnamon bread. Breakfast anyone? Cut each slice of raisin bread in half to form 2 triangles out of each slice. Whisk the eggs, milk (or buttermilk) and cinnamon in a shallow dish. Dip each piece of bread into the egg mixture, allowing any excess to drip off. Put each piece in the baking dish, and then bake in the oven for 10 minutes or until egg mixture has turned golden brown. Divide the toast between two plates. Spoon the yogurt over the toast and top with peach slices and sprinkle with toasted almonds. TOASTING ALMONDS - spread the almonds over a cookie sheet and cook stirring once for 5 - 6 minutes in an oven on 375 degrees. This french toast recipe tastes like Denny's. If you want to learn how to make french toast - Denny's style, here is the recipe. In a bowl, whisk the ingredients together. Heat a large griddle or heavy skillet and when hot add 1 tablespoon of butter. If the pan is smoking, the heat is too high. Deep one side of the bread in the egg mixture for 30 seconds; flip and repeat. Let some of the batter drip off and place in the skillet. Cook each side for 1-1/2 to 2 minutes and when it's golden brown, it's done. To serve, place on a warm platter and lightly sprinkle with powdered sugar. Serve with butter and warm maple syrup.